The blending of traditions and unique touches makes each wedding authentic, beautiful and special. But there is also a lot of detail that goes into making a wedding come together. Our clients always tell us we are always three steps ahead of them in the planning. We focus on the details and logistics so you and your loved ones can let loose and enjoy the day. Below are some pictures from some recent weddings and milestone events we’ve planned. Jillian had been dreaming of her wedding day for years, and wanted to bring her vision to life. She was careful with each and every detail, from the floral arrangements to the china pattern, and her day couldn’t have turned out more perfectly. She got ready with the ladies at Hotel Zachary while her husband-to-be got ready in their home. Then Jillian and Michael tied the knot at Saint Benedict’s Catholic Church and celebrated the evening at Artifact Events. Julie and Carlos were married on a cooler than average September day. However, that didn’t stop them from enjoying the outdoors. They had their first look and family photos in Humboldt Park, and then enjoyed an outside ceremony and a tented dinner reception at the National Museum of Puerto Rican Arts & Culture. It all started back in February 2010 at the study room at Loyola University when Keri spotted Anthony in his bright blue ITALY jacket. Keri was looking for a Biology study partner. She approached him to see if he was interested in partnering and, as he was in a higher class than her, he offered to help her study. The rest is history. It only seemed right that they would celebrate their marriage on Loyola University's campus. After a beautiful ceremony at Saint Benedict's Catholic Church, they hosted a lovely reception in the sun-filled Palm Court’s indoor and outdoor spaces. Angie and Matt celebrated their nuptials at the Floating World Gallery. These two made sure each and every aspect of the wedding day represented them, from having an officiant who is a long-time family friend of Angie's to some of the couple's favorite foods (tacos!) to a DJ who kicked off the dance floor with a unique fervor that got the crowd moving and grooving! To the “T”, Annemarie and Greg’s wedding day was perfection. From the black bridesmaids dresses to the white floral arrangements to the traditional Catholic mass at St. Clement Church Chicago to the classy dinner reception at Salvatore’s Ristorante. Plus this is literally one of the sweetest couples I have ever met! Tom and Alyssa said “I do” at Loyola University’s Madonna della Strada Chapel before braving the chilly winds to get pictures along Lake Michigan. They celebrated the occasion with dinner on campus in the Mundelein Auditorium, which was finished off with amazing cake with raspberry sauce, and then danced the night away with a a live band. Opposites do attract. Michelle, a Director of Risk Management, and Roger, a photographer, fell in love. 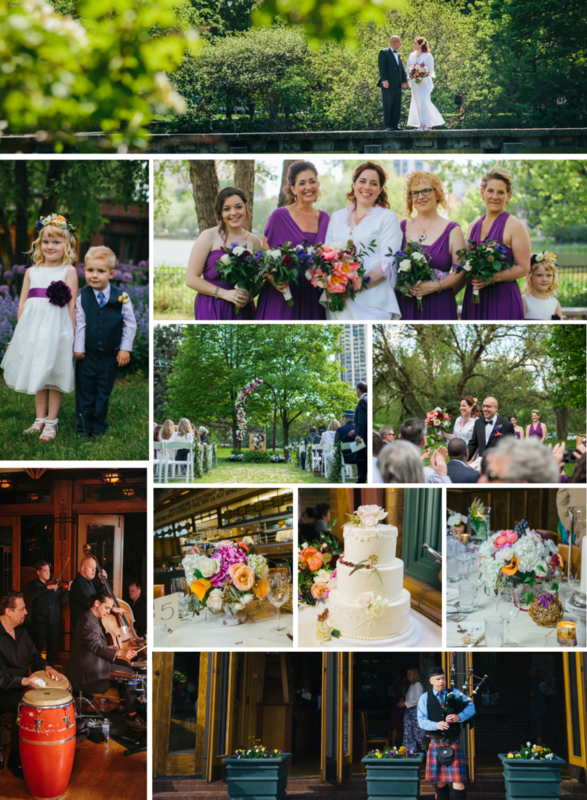 With a shared love for the picturesque backdrop of Lincoln Park, they held their ceremony outside by the lake, with their wedding reception at North Pond Restaurant. A traditional Irish bagpiper led them down the aisle as they celebrated tying the knot, while a Latin-inspired band kicked off the dancing after dinner. Susan and Rob’s day kicked off with the two meeting at Eaton Preserve in the early afternoon for their first look. They then headed to Plymouth Congregational Church for the ceremony. After saying "I do", they closed out the evening with pizza and cupcakes at Warehouse: 109, which is a unique event space with incredible vignettes, including a gallery of antique motorcycles, a vintage bar, and a 1958 Airstream turned into a lounge. 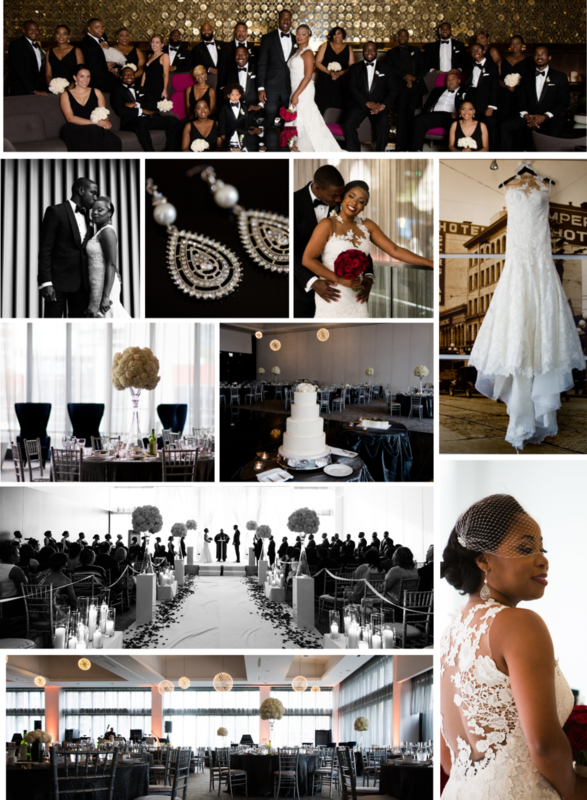 Tanyala and Antaeus' were determined to have a wedding full of elegance and taste. However, their wedding day also inspired incredible emotion. With a first look that had the bride and groom in tears, to a sermon at the ceremony that had every eye in the house wet, to an incredible wedding blessing tradition by the groom's frat, the day was filled with feeling, love and celebration. Amanda and Brandon were married at the private residence of Amanda's parents. When selecting wedding venues, Amanda told her mom that she had so many meaningful memories in that home, and she couldn't imagine being married anywhere else. Her mom was set on making her dream come true. The day was full of personal touches. Amanda is Jewish so the ceremony included many Jewish traditions, including marriage under the chuppah, the bride and her family staying on the right side during the ceremony and the breaking of the glass by the groom to complete the ceremony. Before dinner the challah was blessed and broken. Sarah and Emmett are literally one of the silliest, happiest couples I have ever worked with. And their families were nothing but rays of sunshine as well. They got ready at Hampton Inn Loyola Station. They then tied the knot at Madonna della Strada on Loyola’s campus and then celebrated on campus at the Donovan Reading Room. Kelsey and Jeff shared an awkward third date on Valentine's Day, but by the fourth date, Kelsey knew Jeff was the one! Now this darling couple has sealed the deal and will be spending all future Valentine's Days together! Their ceremony was held at Gary United Methodist Church and their reception at Two Brothers Roundhouse. The day also included a stop for a first look, at which the couple's pup Bailey made an appearance. Photography: Jennifer Claire Photography - Bakery: The Cakery, Florist: Town and Country Gardens, Hair & Makeup: Appease, Inc. - DJ: Red Letter DJs and Lighting: A Posh Production. Photography: Orange 2 Photography - Bakery: Oak Mill Bakery, Flowers: Flor del Monte, Hair: Albert Morrison Hair Studio, Make Up: Lena Clark Beauty, Rentals: AEG Production, DJ: Style Matters. Casey and Ryan wanted a day free of worry and stress. Casey got ready in Room 1520 and they held their ceremony and dinner reception there so they could spend more time with their friends and family and less time traveling between venues. The two lovebirds met at a Starbucks, so coffee became a theme for the night… in fact, they gave guests chocolate-covered espresso beans for favors. Yum! For Sheila and Brian, having a wedding day that truly represented them was a priority. They elected to do a first look a few hours before the wedding so that they could spend time with their closest friends and family capturing images of the day around Chicago before heading to Volo Restaurant Wine Bar for the rest of the events. The ceremony was officiated by Sheila's sister and included "wine blending" in the program. The evening included heavy hors d'oeuvres and ended with macaroon towers and mini sweets. The two also incorporated cultural traditions into the day by dressing in typical Western wedding garb for the first part of the wedding day, and changing into Indian wedding clothing for the later part of the evening. Kate and Eric’s wedding at the Radisson Blu Aqua Hotel was stunningly unique with its woodland-themed decor and hundreds of candles. There were surprises scattered throughout the evening... from butterflies nestled in the arrangements to a blue wedding dress to a second line that popped out and led the guests from the cocktail reception to the dinner. Carleigh and Caleb’s wedding day at The Atrium was definitely one to remember. While it was a humid July day, the couple wasn’t bothered by the weather at all. They had a first look on the venue’s rooftop terrace, a beautiful Jewish ceremony, an outdoor cocktail reception overlooking the city of Milwaukee and a stunning dinner reception followed by a dancing party to remember. Jason and Rizal connected for many reasons, but particularly on their love of travel. By the time they were married, they had been to dozens of cities, states and countries together! They took a break from their adventures around the world to tie the knot at the Morton Arboretum. Their wedding wasn't filled with just the typical traditions. Their ceremony included a tree-planting, and their reception included a tour through the arboretum gardens, Indonesian music, and performances by traditional Indonesian dancers. Jennifer and Kyle’s wedding was full of personal touches. They got married and celebrated their nuptials near where Jennifer grew up in Wisconsin. They hosted the day at Dance Studio 3-D. While the day had sentimental tidbits spread throughout, one of the sweetest parts was that Jennifer’s beloved guinea pigs, Aldo, Pasquale and Lucca, made the trip up to celebrate with them. They were present in so many ways... in fact, instead of wedding cake, the couple served guinea-shaped cookies that looked like each of the darling guineas!!! And Jennifer and Kyle's hashtag was #guineagetmarried. Awww. It was a joy to work with Steven and Kevin, two friends of mine, to plan for their wedding day. I had started planning their wedding with them while they lived in Washington, DC, but they relocated to Minnesota and we started the planning over again in their new location. They had a vision for the colors that would be incorporated into the day. They wanted the bridal party, which was filled with both men and women, to be dressed all in grey so the two of them would stand out as the grooms in navy. The florals they picked were bright autumnal colors. It was a beautiful color palette! As Fiza’s wedding neared, her friends and family wanted to throw her a wedding shower that would be just as memorable and special as the big day itself. The affair took place in Loyola University’s Palm Court, featured Halal food, boasted a beautiful sweets table, and was attended by about 40 guests. With the sun shining, the space looked stunning. As Sara and Calvin eagerly awaited the arrival of their first child, they decided to have an intimate ceremony and wedding celebration. They tied the knot at DuPage County Courthouse before heading to Cantigny Gardens and then Maggiano’s to celebrate. Sara decided to stick with the “courthouse” theme and donned a darling black dress with a white collar for the occasion. Katie and Mark wanted a low-key celebration for their special day. But low-key didn’t make it any less amazing! They tied the knot at the courthouse a few weeks before the wedding celebration so that on the day itself, they could just spend time celebrating with friends and family. 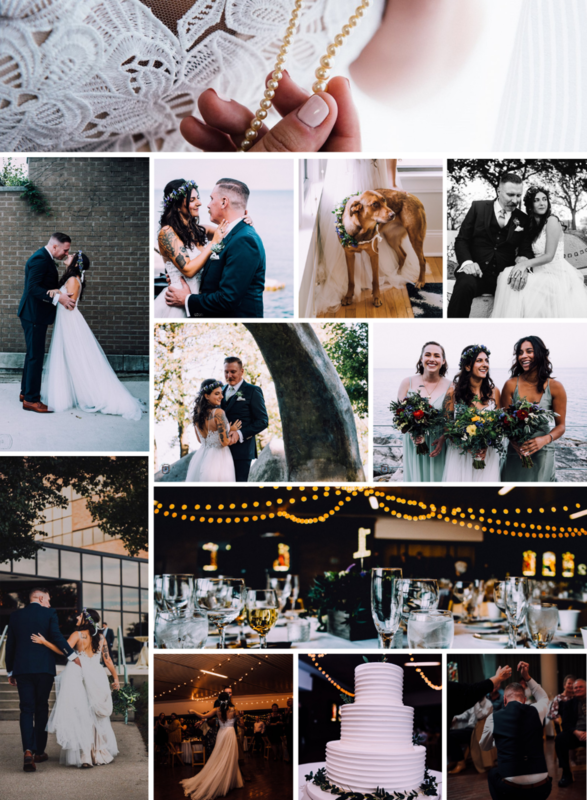 They did a first look right on the lake, took photos around Rogers Park, and then had a dinner reception with their closest friends and family at Crown Center for the Humanities on Loyola University’s campus. Eileen and Michael met in law school. Originally from the Chicago area, they both moved back to the city after graduation, and actually work in law firms in the same building downtown! These two love birds were a joy to work with, and their day was incredibly beautiful. The ceremony took place at Holy Name Cathedral, followed by a reception at Ignite Glass Studios. Ellen and Nate are a match made in heaven, and the day radiated with love and was filled with some of their favorite things. Ellen is a florist, so she and one of her closest friends designed the arrangements for the day. You can see in the backdrop of the ceremony how florals were incorporated into a stunning and unique piece of living art. Ellen adores vintage clothing and selected a vintage dress that fit her like a glove. Also, Ellen and Nate also love tacos, so catering by Irazu (a Costa Rican restaurant) was the perfect touch! The day started off at the Hampton Inn before we headed over to Loyola University's campus for the rest of the festivities. Christine and Austin selected Madonna della Strada for their ceremony. The cocktail reception continued at Piper Mansion on the lake and guests moved to the Mundelein Auditorium for dinner and dancing. And boy did the evening go late! There was a live band and the groom even got up to perform a 15 minute set with his own band part way through the evening! The floor was hopping! The wedding day started with the first look and ceremony at the Bird Haven Greenhouse & Conservatory. It was the first ceremony I’ve been to at which they played Star Wars and Beatles music! The dinner reception took place at Warehouse: 109. What I loved about this wedding is that it was "so Julia and Jimmy..." (their friends and family kept repeating that the whole nice!) and that the entire day was light-hearted and fun. Photography: Emily Speiler Photography - Florals by An English Garden -Catering: Wooden Paddle Pizza - Bakery: Sweet Mandy B's. Diana and Ryan were married at Madonna della Strada Chapel on Loyola University’s campus. Following the ceremony, their guests headed over to Piper Mansion for a beautiful cocktail reception along the lake before heading to Donovan Reading Room for a seated dinner reception. They loved celebrating the special occasion with friends and family. Falyn and Stan enjoyed a beautiful outdoor ceremony on the patio of Piper Mansion. The outdoor space overlooks Lake Michigan and couldn’t have been more picturesque. After tying the knot, the guests enjoyed hors d’oeuvres and cocktails right on the lake. Sara and Anthony’s wedding was a fairy-tale day, followed by an evening of so much fun that even I was moving and grooving! On the wedding morning, Sara got ready at the Hampton Inn before heading over with the ladies to the ceremony at Madonna della Strada. After saying, “I Do”, the celebration continued at Mundelein Ballroom nearby. Alyssa and Eric were married on family property in Glenwood, Illinois. The drive down was so scenic and the property was picturesque. We brought in a tent for the dinner reception and used a patio for the ceremony and dancing. This celebration was beautiful, but also a lot of fun! 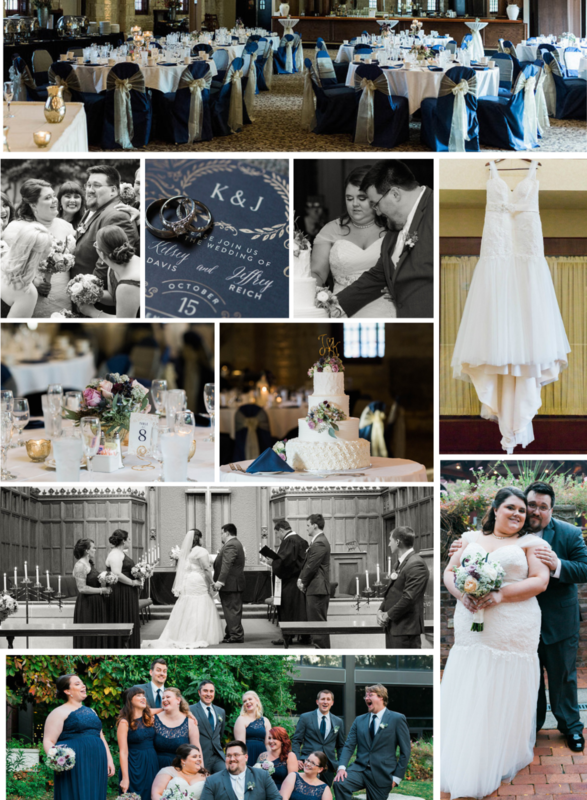 Rosa and Fausto's wedding day was influenced by a mix of Spanish and Cuban traditions. Held at Warehouse: 109, the ceremony and reception had such an elegance to them. The ceremony was accompanied by a string quartet, the cocktail reception by Spanish guitarists and the dancing by a DJ. The menu for the evening included Spanish-inspired hors d'oeuvres and scrumptious seafood paella. Sarah and Joe had a church ceremony at St. Luke's United Methodist, followed by a cocktail and dinner reception at the Grand River Center. Navy with pops of yellow embellished the venues. Everyone danced the night away and had lots of fun celebrating the union of Sarah and Joe. Photography: Sarah Seeley Photography below!